Mio Cyclo 315 cycling GPS system features a 3-inch antiglare touchscreen and European mapping. You can use this large screen to navigate on your bike and you can also use it in-car to navigate on the road to your destination. The Mio 315 is suitable for both indoor training and outdoor cycling. Also included is a barometric altitude and temperature on screen. 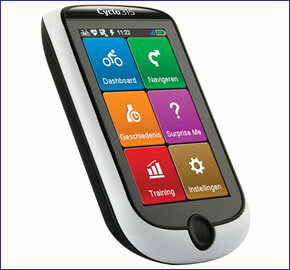 There are 4 models of the Mio Cyclo 315 available from ActiveGPS. These are either UK and Ireland or European mapping and a choice with or without Heart Rate Monitor and Speed and Cadence sensor. Mio Cyclo 315 has been discontinued. The Mio Cyclo 315 is a cycling GPS system that is lightweight and offers all the information you will need on the anti-glare 3-inch touchscreen. You can use the Mio 315 to show bicycle routes for cycling and you can also use this device to navigate on the road by car where you will receive turn-by-turn directions to your destination. 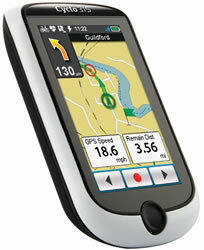 Included with this Mio GPS is mapping for Western Europe. The time, speed, distance, height and calorie consumption will all be displayed on screen. You can also get access to Points of Interest such as bike shops, emergency locations, food and drink and more. You can use the Mio Cyclo 315 for indoor training or outdoor on a bike. The battery life is 12 hours so you can use it on long journeys without needed to carry extra batteries with you. There is a 'where am I' function that allows you to see where you are. Plus you can share tracks, view barometric altitude and also temperature on the screen. When controlling the cycling GPS device you can use the large on-screen control buttons. With the Cyclo 315 you can also store data and manage route history. Plus you can download the latest map updates. A great feature is the 'Surprise Me' mode. For this feature to work you are required to enter the time you want to cycle for or the distance you want to cycle and then the Mio will provide 3 bicycle routes for your to choose from. This can be useful in unfamiliar regions where you do not know the area and you cannot select your own route. With the included ANT+ sensor you can view time, speed, distance, height, calorie consumption and more. There is an AC charger included with the purchase and a bike mount kit for installing the Mio 315 on your bicycle. A speed and cadence sensor is also included.